Strong wind and very strong wind has characterised the last two Wednesdays and weekends. Wednesdays have been blown off; last Sunday too, and on the previous Sunday only 3 boats ventured out in the morning before it became unsafe for them and the rescue team. Saturdays have been marginally less breezy allowing the 29er, Feva and Laser youth sailors to practice capsize recovery and heavy weather boat handling. Thank you to all the duty and rescue teams for your diligence in keeping a look out, being out on the water and making wise decisions about when sailing should not take place. Also the eagle eyed among you will notice the changes/repairs/improvements our Rear Commodore, Mike Higgins, has been making. The Training Room is looking much smarter with new flooring and will soon be redecorated. Things are slowly happening in the gents changing rooms – wheels fitted to the large benches to enable them to move for better floor cleaning, removal of the large, obstructive pillars (thankfully the roof didn’t cave in! ), and new shower mixer heads. And we have smarter seating in the main club room. You will see a new, faster computer in the Race Hut, thanks to Dave Pye for the sourcing and installation. And there is a new wifi system at the Club – lookout for the access code in the main room. Membership Renewals – it’s that important time of year again! Many thanks to everyone who has renewed their membership already – it is hugely helpful to Rosie, spreading her workload. If you intend to renew and haven’t done so yet please can you do it as soon as possible as the 2018/19 memberships expire at the end of this month. If you would like help or guidance, Rosie Bowers (our Membership Secretary) will be in the main room of the clubhouse this Saturday (16th March) from 11am–2pm (please bring your WebCollect Sign-on details with you: Email address and Password, or a means of accessing email). Wednesday 20th March – Wednesday Warmer talk by Dave Curno – 6.30 for a 7pm start. Dave Curno is the RYA Regional Planning and Environmental Co-ordinator. He is going to come and talk about “Environmental Issues for Sailors”. Whilst his usual talk is largely marine based, he has promised to emphasise the freshwater aspects. Rob will have the Galley running from 6.30pm and the Bar will be open, aiming for a 7pm start. Wednesday 27th March – 2nd Race Officer Update evening – 6.30 for 7pm start. AN EARLY WARNING – this will be a busy weekend for the Club with Bath University hosting their Alumni event and a Class race day on the Sunday. Bristol Water have kindly allowed us to park at Woodford Lodge during the weekend – this will be for all duty teams and cars not towing a boat. Jeff Stratford and his Police Group have volunteered to direct the traffic so please, make their life easy by following their instructions. Would you like to be able to sail on Wednesday afternoons in the school holidays, 2pm to 4.30, when the universities and schools aren’t there to provide safety cover? We’d like to know how much interest there is and put together a volunteer duty rota, in the first instance, for the Easter holidays: 2 rescue helms for each date. Why not be the first to volunteer for one afternoon (dates below) and then those that go sailing can volunteer for future school holiday afternoons? Longer term, if popular and successful, we aim to include this as part of the normal duties allocation. Wednesday 10th April and Wednesday 17th April. – Both dates lead into the Wednesday evening racing series so you can hand over and go sailing in the evening. Would you like to sail on Wednesday afternoons in the school holidays? Can you volunteer for safety cover for 10th or 17th April? Lake & Cake is back this year on the following Saturday afternoons. Sat 1st June (3)Sat 29th June (Ladies day – trophy race, training & Social). The finishing touches are just being put to the 2019 Summer program for the club’s junior and youth sailors. Over the next few weeks, specific announcements will be going out for each of the activities; from Chew Crew beginners and intermediates, through junior race days and team racing, and the continued Laser and 29er race training for the more experienced youth sailors. Chew Crew will start in early May, with both beginners RYA Stage 1 & 2 courses, and an Intermediate group for those who already have their Stage 2 certificates. Friendly informal group tuition is provided for youngsters aged between 8 (by the 1st May), and 16. Dinghy Instructors, Assistant Dinghy instructors and experienced club members will give tuition. Training will be given in Optibats, Toppers and Tera dinghies and occasionally double handed dinghies with full safety cover on Sunday mornings from 10 am until 1pm from May to September (with a 3 Sunday break in later July/early August). New for this summer, as an extension to Chew Crew, is a Junior Race Day, running approximately monthly. Aimed at those in the Intermediate group and above, who want to improve their sailing and to try out some racing. The goal is to improve sailing skills while having fun. It will be a full day program with coaching provided by RYA Junior Race Coaches in the morning, and coached racing in the afternoon. All junior classes will be very welcome to attend – Optimists, Teras, Toppers, Mirrors and Fevas. Included within the Junior Race Day will be the previously stand-alone Topper and Feva race coaching sessions. The stand-alone Topper and Feva coaching days will return in the Autumn once the summer Junior Race Days have finished in September. August Antics will be held over the August Bank Holiday with the usual mix of something for everyone; some improvement sessions, some fun and games, and some races for the coveted August Antics trophy. Mark it in your calendars, details to follow nearer the date. For those keen on racing, or keen to start racing, two & three boat team racing is a new initiative at the club, run in cooperation with Clifton College. The club Fevas have been used for the first couple of sessions, and we will be training with Clifton College in their Fireflys when we are able. The team are hoping to enter the Western Schools Regional competition hosted by Clifton College in May, and the Eric Twiname junior and youth team racing championships in October. This is a great opportunity for keen, less experienced sailors, to crew for the more experienced racing sailors both for the coaching and in the competitions. Session booking is already live on webcollect. The Youth Laser and 29er race coaching sessions will continue through the summer, approximately monthly. The new summer dates are regularly being added as RIB bookings and coaches are confirmed. Register via webcollect. To keep up to date on all the junior and youth activities and sessions visit the youth section of the club website. The whole section will be updated with summer 2019 content over the next few weeks. 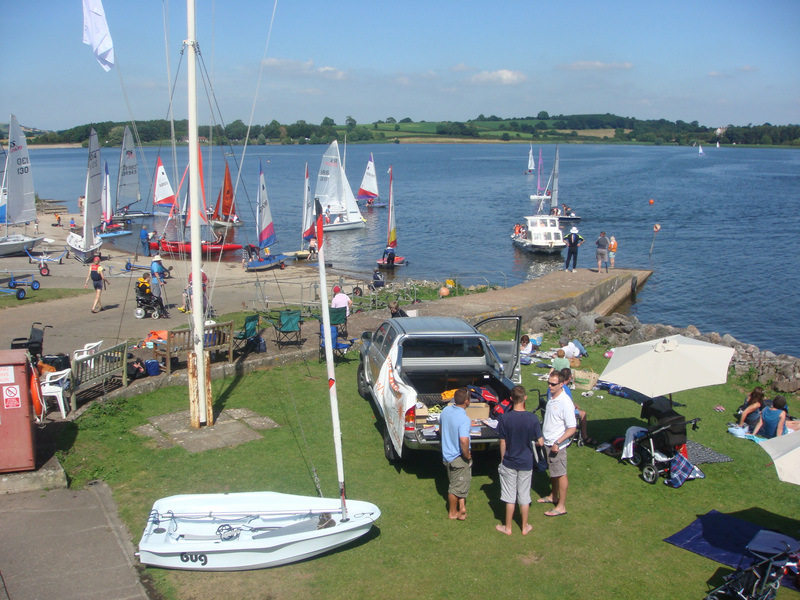 Finally, I hope the sunny Regatta picture reminds us all that Spring has sprung!